Sri Lanka will stick to the three spin strategy in a bid to square the Test series against England as the second Test starts here at the Pallekele International Stadium today. 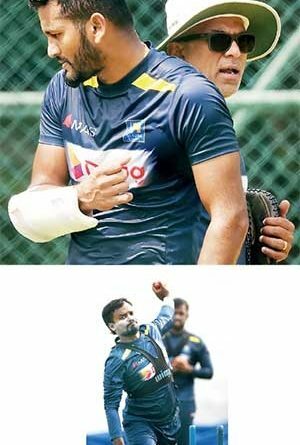 Of all cricketing centers in the country, P. Sara Oval and Pallekele offer more assistance for seam bowlers but the hosts believe the best way forward is to play the lone seamer and back the three spinners. England won the opening Test of the three match series in Galle last week by a massive 211 runs and a win here or in Colombo next will give them their first series win in Sri Lanka in 17 years. “If we want to play an extra seamer on a spinning pitch like this, we’d have to get rid of a batsman. Our weakness right now is batting, and given that, I don’t think we can play with one batsman fewer. Because the pitch is a turner, what we’re talking about right now is playing just one seamer,” Sri Lanka’s stand in skipper Suranga Lakmal told journalists. Lakmal will fill in for the injured Dinesh Chandimal, who is nursing a hamstring strain. Middle order batsman Roshen Silva will replace Chandimal while Sri Lanka will decide between Malinda Pushpakumara and Lakshan Sandakan to replace veteran Rangana Herath. Sri Lanka’s batting let them down in Galle as only former captain Angelo Mathews was amongst runs scoring twin fifties. Lakmal was confident that the batting will click in Kandy. “As a team we’ve talked about the batting a lot over the last few days. We’ve prepared a plan, and we worked hard on it. I think because of that we’ll be able to play better here than we did in the first Test. “Just because we lost a match we haven’t fallen psychologically. No matter what, we are still playing at home. Just because we’ve lost a game, that doesn’t mean we’re mentally low. This is a vital match for us because we’ve got to stay in the series,” added Lakmal. England meanwhile are likely to play the same team which means number one choice wicketkeeper Jonny Bairstow will be out of the equation. Bairstow hurt his ankle while playing football during the ODI leg of the tour. Ben Foakes replaced him for the Galle Test and made a hundred on debut. Seamer Stuart Broad, who was expected to play at Pallekele will have to wait too as England bank on their three spinners on the dry surface. Sri Lanka (Probable): Suranga Lakmal (Captain), Dimuth Karunaratne, Kaushal Silva, Kusal Mendis, Angelo Mathews, Dhananjaya de Silva, Roshen Silva, Niroshan Dickwella (Wicketkeeper), Dilruwan Perera, Akila Dananjaya, Malinda Pushpakumara or Lakshan Sandakan. England: Joe Root(Captain), Keaton Jennings, Rory Burns, Moeen Ali, Jos Buttler, Ben Stokes, Ben Foakes (Wicketkeeper), Sam Curran, Adil Rashid, James Anderson and Jack Leach.